A vehicle has so many components in it that at times many of them are forgotten or overlooked. When it is time for maintenance these smaller and lesser known parts like the starter relay are not given much thought, but in fact, every part is important and vital in ensuring the correct functioning of your car. The starter relay is an electrical component that holds the responsibility of transferring power from the battery to the starter, which ignites the car’s engine. This small part does not commonly go through a breakdown but since it is an electrical component, anything can happen at any time. In order to know when the starter relay is moving towards failure, you need to find out the symptoms of a starter relay failure and that is what we will help you out with. Since the relay is an electrical component, its performance can be affected due to a number of factors. Number one on the list of problems is the accumulation of dust and debris. Dust can disrupt the relay’s performance and cause it to malfunction. Other than that, a power surge from the battery can destroy a starter relay, so there are lots of things to look at. We will come to the solutions once we know the symptoms of a failing starter relay. It’s quite obvious that any malfunction of the starter relay is bound to cause problems with ignition. Once you insert the key in the ignition and twist it to trigger the engine, the relay receives the information and does its job of transferring power further to the starter but a failing or bad starter relay will be inefficient and it will not be able to perform this task ideally. Therefore, if you feel the engine is not budging even when you are twisting the key, it could mean you have a bad starter relay that needs replacement. It is possible that a relay is successful in sending power to the starter but it is not able to cut it off. When a relay is joined to the system it completes a circuit. However, if the starter relay is not working properly, it might give life to the starter but it might not be able to cut it off when the engine has started. This can happen because the main components inside the relay have stuck together in the ‘closed’ position. If this happens, you are looking at extensive damage to the starter, circuit, and the transmission flywheel. The problem with a failing starter relay is that it will work brilliantly sometimes and in other instances, it won’t work at all. The relay comes under lots of abuses because it is unprotected in the engine bay, so lots of heat, dirt, and dust that accumulates on it can alter its performance. If you start your car once and it starts without fail, then you start it again and it doesn’t start at all, you are looking at a failing starter relay. Whenever this happens it is advisable to look for a mechanic that can help solve the problem. Sometimes when you try to start a car, you hear a ticking sound coming from the engine but the engine doesn’t start. This sound is actually coming from the relay which is signalling to you that there is the improper delivery of voltage and ampere from the battery to the starter. This only happens if the relay is unable to send power further to the starter because it is unable to function properly. As we mentioned before, a starter relay can take a lot of abuse in the engine bay by constantly battling heat, dust, and debris. This torment can affect a relays vital function; therefore, it is necessary to keep it clean from pollutants. The starter relay should be cleaned monthly if not twice a week. Clean it more frequently if you reside somewhere where there is lots of dust. Cleaning a starter relay is easy, here we will give you a step by step guide to clean a starter relay. The starter relay is situated right in the middle near the battery of a car. In most cars, it can be found inside any fuse box. It is a box-like structure that typically has a white housing. There are some wires coming in and out of it from below. When you see an object like that, you have probably found the relay. However, there are more than one relays in a car, so make sure you have found the right one. 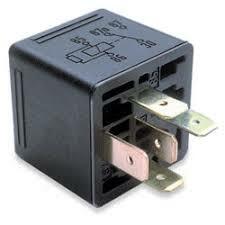 Since the relay is an electrical component, it can blow up if you apply water to it directly. Therefore, you need to approach the relay with care. First, make sure your car is completely switched off then proceed to switch on the blower while pointing towards the relay. This will remove all the dirt and dust which recently deposited on the relay. Once you are done with the blower, take the cloth and soak it in the water ever so slightly. Rub the outer part of the relay gently, removing all the remaining dirt with electrical cleaner spray. Once you are satisfied with the cleaning, use the blower one last time to ensure all the water has dried. Make sure it’s really dried, a small amount of water can short the lines and destroy other parts. Insert the key into the ignition and start the car, if you are still having trouble starting up the car, you need to visit the mechanic for relay replacement. Relays are generally very cheap and easily available. Therefore, your mechanic won’t charge you too much. Generally, you will be charged around $100 in total, including the labor cost and the cost of the new starter relay.